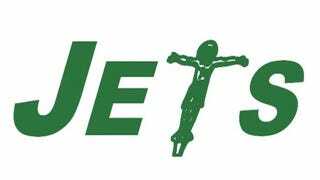 There is absolutely no reason why the Jets would need to redo their logo just because Tim Tebow, who happens to be extremely religious, is about to bring his own unique brand of "football" to the New York/New Jersey metropolitan area. Therefore, we're confused why CNBC's Darren Rovell would feel compelled to scour Twitter for examples of new Jets logos and then retweet amateurish imagery that replaces the Jets' T with a crucified Jesus hanging from a cross. Finally, our long national nightmare is over, so says ESPN&apos;s Adam Schefter. The Twitter user that Rovell credits didn't try to "tip" him with this crude and somewhat offensive bit of design, so Rovell either searched specifically for Jets' logos or he hit up the #Tebow or #NYJets hashtags looking for hidden gems of tweet-worthy info. (And if that's the case, then who the hell can figure how he found this particular piece of flotsam amid all that unholy jetsam.) Either way, late Wednesday night, the logo made its way to Rovell's Twitpic account, although if he really wanted to laud his discovery, he would have posted it to his swank WhoSay account, an invite-only service reserved solely for celebrities. And hey, we totally get the philosophy that "retweets do not equal endorsements" and all that, but the RT in this instance doesn't add any value, doesn't attempt to engender any sort of thought or discussion, and (frankly) it's offensive to football fans or either religious or secular persuasions. Worst of all, it's just not good. No one's life was enriched or bettered by this seeing this. Rovell's followers found the tweet "offensive," "very tasteless," "horribly offensive," and "not funny at all," among other similar sentiments. Alienating your followers with quasi-offensive religious iconography? Surely, that must break a rule or two somewhere.